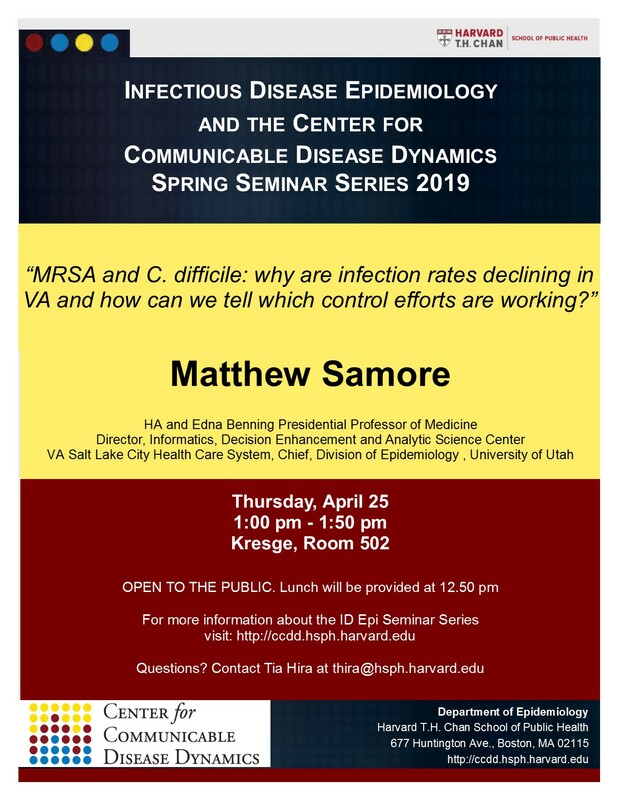 Matthew Samore, MD is Chief of the Division of Epidemiology at the University of Utah, Director of the Informatics, Decision Enhancement, and Analytic Sciences (IDEAS) Center at the Salt Lake City VA, and an HA and Edna Benning Presidential Professor of Medicine. He is Principal Investigator of the Utah sites for two CDC-funded networks, the Prevention Epicenter Program and Modeling Infectious Diseases (MInD) in Healthcare. He attended the University of Wisconsin School of Medicine, completed his residency in Internal Medicine at Washington University in St. Louis, and his Fellowship in Infectious Diseases at Brigham and Women’s Hospital and Beth Israel Hospital in Boston. He was a member of the faculty of Harvard Medical School for eight years prior to his move to Utah. His research spans epidemiology of healthcare-associated infection, implementation of antibiotic stewardship interventions, and analysis of electronic health record data.